We moved on 1/2/14. Please visit our contact us page for updated address information. For over forty years, Ed Sueta Music Publications, Inc. has been dedicated to providing band directors with the most effective, logical, and consistent instructional methods for young instrumentalists. 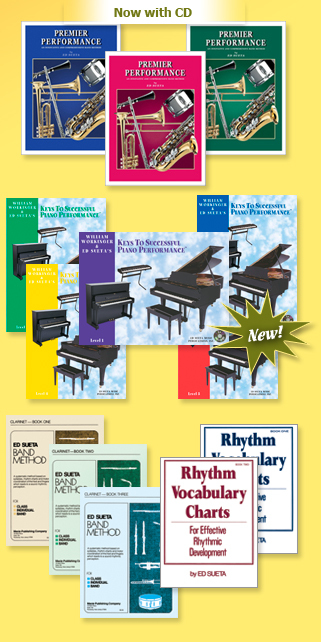 Publisher of the Ed Sueta Band Method and Premier Performance® for Band, Ed Sueta Music also publishes outstanding collections of beginning duets and band arrangements. The Musical Artistry Series is a highly regarded compilation of 86 trios and quartets for all levels which have been selected for a number of state performance lists throughout the country. We are pleased to introduce Keys To Successful Piano Performance® - a comprehensive, five volume piano method by William Workinger and Ed Sueta. Keys utilizes a unique pedagogical approach based upon years of experience gained through piano instruction and learning research. Keys is ideal for both individual and group lessons as well as piano lab. retro reels slot We encourage teachers who have not received our publications to contact us for complimentary review copies. Please call us toll free at 888-725-2333 and we will be happy to provide you with additional information.